Gavin Dingman shot this rare albino buck in Michigan with his crossbow. Photo taken by family of Gavin. Most 11 year olds don’t get the chance to shoot a big 12 point buck in Michigan, hell, most hunters don’t in Michigan, but that was not the case for Gavin Dingman. 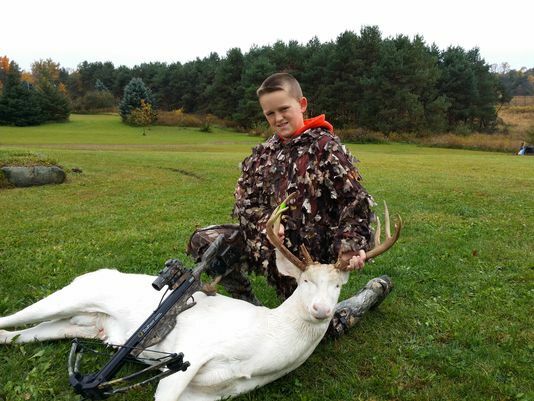 Gavin, 11, of Oceola Township in Michigan was able to shoot this 12 point albino buck last week with his crossbow while hunting with his father. The Dingmans had spotted the buck several times in earlier seasons and had photos of it but this is the first time they had a chance to shoot the trophy whitetail buck. Mick Dingman, Gavin’s father, said his two sons were arguing about whose turn it was to hunt with their dad that night over dinner. Luckily for Gavin, it was his turn. When Gavin shot the buck he said he was, “very nervous.” Gavin’s father though said that he was fully confident in his son and never had any doubts that the shot would be true. Gavin double lunged the buck at 30 yards and now he has a gorgeous trophy for the rest of his life. Hopefully the family has a lot of room in their home because the Dingmans decided that they’ll be getting a full body mount of the rare albino buck. “It’s too rare and too pretty not to spend the extra money and have the whole thing done,” Mick Dingman said. For now, Gavin can enjoy the fame that has come from killing this Michigan albino buck. His classmates have been very impressed with his kill and so have many news stations and blogs just like ours. Albino deer are very rare but there are some in Michigan and Wisconsin. Some people are upset that this buck was killed but it was killed legally and we’d love to congratulate Gavin on his awesome trophy. According to USA Today in a December 2013 report, Wisconsin naturalist John Bates, co-author of “White Deer: Ghosts of the Forest,” said albino deer are born once in about 20,000 births. Some biologists claim only one in 100,000 deer is born albino, the report said. See more big buck news and pictures of another rare deer, a black fawn here.